Obama Signs Texas Disaster Declaration As Death Toll In Flooding Rises : The Two-Way "There has been enough rain across Texas during May to cover the entire state nearly 8 inches deep," says the National Weather Service in Fort Worth. The number of people who died because of storms that have inundated parts of Texas and Oklahoma this week has hit 25 people, after search crews found a drowned truck driver whose vehicle had overturned in a culvert near Dallas. That's the word from member station KERA, where Lauren Silverman reports that a new batch of storms that hit Dallas-Fort Worth "dumped three to seven inches of rain on an already over-saturated area" Thursday night. All that water created treacherous conditions for Friday morning's commute; widespread and serious delays were reported. "Flooding on roadways submerged vehicles, and the Dallas Police and Fire department conducted more than a dozen stranded vehicle rescues," Silverman tells NPR's Newscast unit. And as KERA notes, more than a dozen people are still missing: "The recent storms have caused widespread flooding in the southern Plains, killing at least 21 people in Texas and four in Oklahoma. Texas has 14 missing people." Along the Blanco River in central Texas, searchers have found six bodies and are looking for more, NPR's John Burnett reports from Austin. John says around 100 volunteers are helping to look for victims, supplementing a search and rescue team of about 50 people. 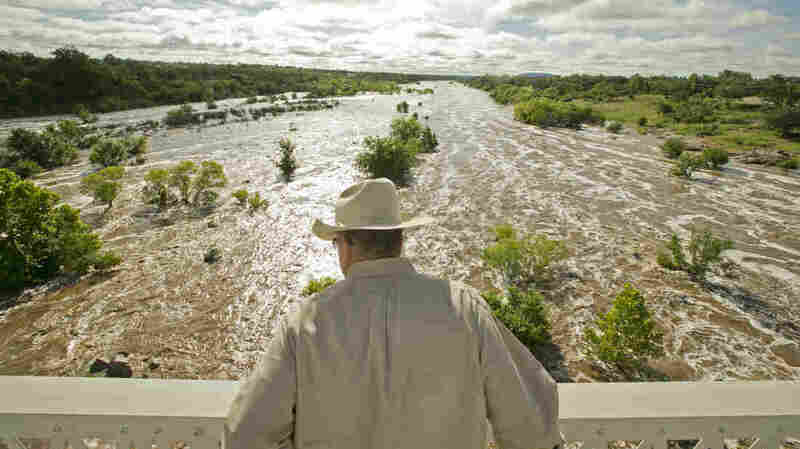 "They're looking for members of three families who were washed away inside a vacation house when the Blanco roared out of its banks," John says. Search crews are using dogs to help find victims in large and tangled piles of debris. Will Boettner, state spokesman for the operation, tells John: "The debris fields and the piles of debris that have accumulated, they're very tall — some of them are 25 to 30 feet tall. They're large enough that you could easily hide in them. Therefore they're also large enough that there could be victims within them." More water is on the way: Rain is predicted in the Dallas-Fort Worth area tonight. And The Houston Chronicle reports that the National Weather Service has issued a flash flood watch from Saturday into Sunday morning. "There has been enough rain across Texas during May to cover the entire state nearly 8 inches deep," the National Weather Service in Fort Worth said in a tweet today. "That's over 35 trillion gallons!" The agency then showed its math, in another tweet. President Obama has signed a disaster declaration for the regions in Texas that have been affected by the devastating floods. The statement opens up federal funds to assist in repairs and recovery throughout the region. Texas Gov. Greg Abbott had requested such a declaration, the AP reports. Earlier this week, Obama issued a similar declaration for affected areas in Oklahoma.